Published: Feb. 19, 2014 at 04:08 p.m. Updated: Feb. 20, 2014 at 04:26 p.m.
INDIANAPOLIS -- For a handful of football players, freshly removed from the amateur ranks, the next seven days or so will represent the most important time they'll spend in the pre-draft process. Their resumes have been mostly built on their days in college, and for the vast majority of the 335 players who will attend the NFL Scouting Combine here nothing will change. But for some, this will make or break their draft standing. 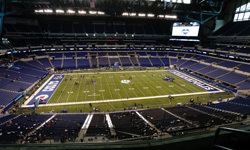 My NFL.com colleague Bucky Brooks did a nice job this week discussing the freaks and flops of previous combines, guys who made and lost a lot of money from their four-day stay in Indianapolis. Last year I predicted the stock for EJ Manuel and Cordarrelle Patterson would soar coming out of the combine. Both players entered Indy with second-day grades. Both, because of their showings, were taken in the first round of the draft. This year, the player who I believe will make the biggest jump is UCLA OG Xavier Su'a-Filo. Su'a-Filo has an interesting backstory, having served a two-year Mormon mission that split up his college career. He started 13 games at left tackle for the Bruins as a freshman in 2009 (becoming the first UCLA player ever to start from Day 1), was gone for the next two years on the mission in Florida and Alabama, then returned to become UCLA's full-time starter at left guard. He gave up his final year of college eligibility to enter the draft. Su'a-Filo, who is scheduled to work out with Group 2 on Friday, will have an opportunity at the combine to show off his athleticism and speed, which should be enough to land him in the first round of the draft. Right now, most teams have assigned him a second-day grade, but he'll move up. And the team that drafts him will have a Day 1 starter at guard.